I'm slowly getting through my post trip depression. I often find myself fighting this type of sadness after a memorable trip. The sadness of this trip ending will soon subside and the lasting memories its created will be filling those times when we need a boost of positive energy. France is my happy place. That's mostly due to it being my favorite place in the world to ski but the people, food, and landscapes seal the deal. The aura surrounding the mountains and valleys here gives off this energy of adventure that doesn't compare to many places I've visited. Choosing your own adventure here means a little more. Choosing wisely can change your life while choosing poorly can end your life. Our week in the Chamonix valley started with the traditional "adjustment day". This day is used to convince the body it hasn't crossed multiple time zones and that food and drink are better than sleep. We arrived in town to a beautiful day in the mountains. The sun was shining on the valley floor and the sky was that perfect shade of blue. With no plans to ski our first day this weather was a great boost of energy for tired bodies while roaming through town. The first stop was the weekly market in the center of town to pick up a few essential items for a ski week in France. Local cheeses and meats along with fresh bread would be a good starting point. The hangry train then rolled onto a sunny, street side, terrace for a long lunch under the eye of the Mont Blanc massif. Lunch included local specialities like Tartiflette, Salad Savoyarde, and of course red wine. Trying to avoid any post lunch food comas, the rest of the afternoon was spent wondering through town soaking up the sun while sampling any local libations that looked interesting. As the day quickly turned into night we wrapped up a successful "adjustment day" on the panoramic porch of our apartment watching the sun set on the Aiguille du Midi. Tomorrow we ski! Somewhere in the haze of jet lag and wine of our first day, Tim Hugo planned to met a fellow Aspen ski patroller who was in Chamonix working at Le Brevent. One of the great perks of ski patrolling is the hospitality shown by a host mountain to other visiting patrollers. Sometimes it's just some local insight on where to ski the goods. Other times it may be a free beer at the bar or even a free ski pass for the day. But when Sam was gracious enough to give Hugo eight complimentary day passes, we were blown away. There's nothing like a hometown hookup in a foreign land. Nice work Hugo! Thanks Sam! Waking up to another beautiful day of sun and blue skies, the group decided that the Grands Montets would be the first stop on our tour of the valley. After a quick breakfast of local pastries we hopped on a bus for the ski area and made our first run around mid day. Mid day you ask? Well, as you may know by now, Europe is having one of the worst snow years in it's recorded history. Maybe not the worst ever but pretty damn close. With that being said, the lack of snow never put a damper on our trip. With the unseasonably warm weather and lack of snow the late start was just about right. We made our way to the top of the Grands Montets and took in the view of the valley. Chatting about the routes and areas we'd be skiing throughout the week. 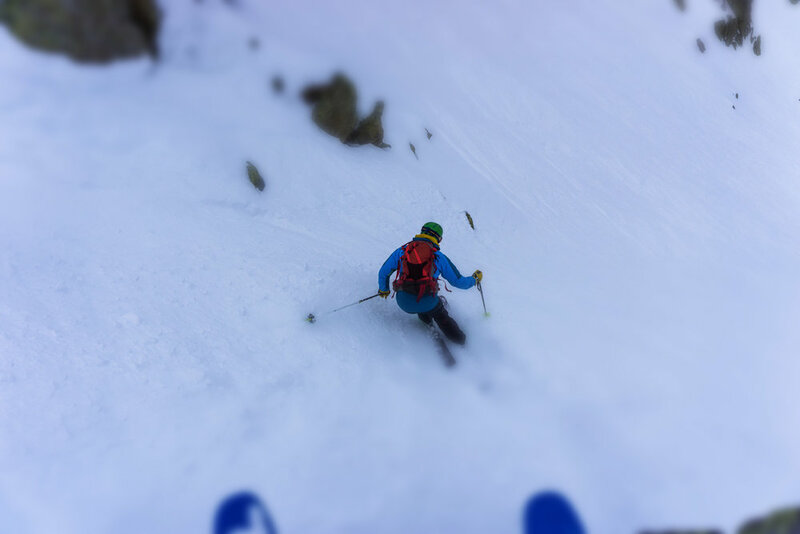 We opted not to ski the couloir off the observation deck that Schmidt and Plake had skied in Blizzard of Aaah's. There just wasn't enough snow. The skiing down to the Argentiere Glacier was actually pretty good for the first thirty or forty turns. Then we had to shift our concentration onto the views and the survival skiing. We mixed it up a bit with a couple different variations down to the glacier. One route went pretty smooth and the other was a bit dicey in spots. Dicey meaning not much snow and lots of rock. None the less a great first sample of skiing in the Alps for the Hugo's. Our ski day ended with a well deserved apres snack at the Refuge d'Argentière before we'd ski down to the the base area while fearing for our lives on-piste. For the rest of the afternoon we continued our apres festivities at the apartment while folks relaxed and showered. Then we were off to town to meet our guide, Bastiou, and dinner. We met Bastiou for a couple of beers to discuss the plan for the next day, which was to ski off the Aiguille du Midi. He had a great variation of the Vallee Noire planned and we were all stoked to see what was in store for us. Dinner would be another great, traditional, Savoie meal. Raclette. This particular restaurant served the raclette under a heating element so you can scrap the melting cheese off the giant, half wheel of cheese onto your plate of potatoes and meat. This very simple meal is also served with a green salad to make you feel better about your next few hours and of course red wine to wash it all down. Afterwards, we rolled home in anticipation of the next day. Aiguille du Midi at sunset. 9000 feet above our apartment on the valley floor, we could clearly see our first challenge of the day. The Arête des Cosmiques. This 200 meter long path of snow and ice was our entrance into the world of glaciated terrain hidden behind the Aiguille du Midi. Stay on the meter wide path and all will be fine. Somehow fall off that sidewalk of snow and ice and death is certain. This easy hike off the top of the Aiguille du Midi is done by thousands of people every year and is relatively safe. But the tricks your mind will play on you when it knows that if something were to go terribly wrong, not much would stop you from falling thousands of feet to your death. Focusing your mind back to the idea of just walking down a sidewalk is hard to do. Even when you know the probability is very low that you could fall off a sidewalk. Our arete experience went fairly well. I think most of us had some personal challenges to push through but we need those every now and then. Kate and Heidi worked their way down while roped to Bastiou, who gave the ladies very little time to think about the consequences. Charlie, Tim and I got caught behind a man struggling with his own challenges. Which allowed us to take the time to think about and see the consequences of not being roped up or having crampons on. As for Owen, I believe he ended up running down the arete for safe measure. We had all overcome our biggest hurdle of the day. Now all we had to do was enjoy a perfect day touring around the peaks and glaciers of the Monte Blanc massif. This tour will be one of those days that will be hard to forget. As we skied down past all the classic climbing routes off the Monte Blanc we gaped at the size of our surroundings over and over. Once we arrived at the bottom of our first real glacier crossing we put our skins on our skis and roped up into two groups to safely travel across the endless crevasses. Bastiou did a stellar job in choosing a safe route that still allowing us to see in and out of these giant crevasses. Working our way off the heavily crevassed area of the glacier we passed below the La Tour Ronde and started uphill towards the Pointe Helbronner. The Helbronner is on the border of Italy and it would only be fitting to stop by the Refugio Torino for a quick beer and coffee. Bastiou gave us all the beta on the routes on the Italian side of the Monte Bianco massif while we enjoyed some refreshments. Bastiou has been skiing, climbing, flying, etc in Chamonix for a while and he was full of the local history and routes in the area. He was a huge part in making our trip to France a great one. From the top of the brand new Skyway Tram that accesses the Pointe Helbronner, we had nothing to do but enjoy the views and ski down through the Vallee Noire to the Mer du Glace. During the planning stages of this trip we had told Bastiou that we'd like to ski a variation of the Vallee Blacne since we'd already skied the classic route from the Aiguille du Midi. He crushed it! The route through the Vallee Noire was spectacular. The views from across the valley were outstanding and the skiing was even a bit adventurous. I think Bastiou said to us a couple time that he trusted our skiing but that falling was not an option. Perfect. Bastiou pointing out the goods. With the season being so lean on snow our only option to exit the Mer du Glace was to hike up to a gondola that would take us to a train in Le Montenvers and ride back to Chamonix. The hike up is a depressing sign of the global wierding going on today. As you hike from the valley floor you start to notice the signs indicating where the glacier had once been. For example, the base of the gondola that took us to the train was built in the seventies at the level of the glacier, today you have to hike hundreds of feet just to get to that same base. Bastiou claimed that the glacier had receded more in the last 15 years than it had over the previous 50 years. Bummer. Get here before its gone! Mr. Chardonnay Jr. slaying french pow. The weather had changed just a bit for our next day of skiing at Le Brevent. There were actually clouds obscuring the sun. In France? No way. It was going to be a classic Jour Blance day. Which meant low visibility and probably some piste skiing. Hugo had some Aspen Highlands swag to give to Le Brevent ski patrol and luckily the first patroller he met was the man who had been to Aspen for the exchange years prior. Ludo was very excited to connect with Hugo and with perfect french hospitality offered to show us around his mountain. Ludo took us through a mysterious maze of huge rocks and gullies which brought us right out to a steep, off-piste run. Ludo nailed it. The snow was the best we were gonna find that day and it may have been the best of the trip. We made a couple more laps before a quick, chicken nugget lunch on the hill. The weather had a big factor in our planning for the remainder of the day and we wrapped it up pretty early. Stopping one last time to enjoy a sucker hole of sun with some wine before we headed down the hill. I think we pulled Hugo off the hill a little earlier than we was expecting, sorry buddy. Unfortunately the next morning we had lost one of the gang to illness. Tim had been fighting all night against a stomach bug and would be missing our adventure over to Italy for the day. We missed him tremendously. Earlier in the week we had set up a ride over to Courmayeur with Sam, the Aspen patroller on exchange, who had a car and a tunnel pass we could use. Thanks Sam! Since Sam had injured her knee just a couple weeks prior to our arrival she was not going to be skiing but she would joining back up with us for the afternoon festivities. We hopped on the Val Veny tram first thing in the morning and made our way over to an on-mountain bar for a few samples of Italy's finest coffee. Many people say that the coffee in Italy is better than the coffee in France. I'm not sure if I agree but I do know they both are fantastic and crush most coffee anywhere else. While we enjoyed our coffee we let the sun do its thing on the snow and slowly started making our way to the top of the Arp. The views of Monte Bianco from the Italian side are amazing. You feel much closer to the summit of the mountain and the surrounding valleys are enormously deep. Our route would take us right to the floor of the Val Veny where we'd follow along the shadow of Monte Bianco until we reached our exit chairlift. The skiing was again mediocre but the views and sun made up for any doubts about the snow. Waiting patiently before the sickness takes hold. With just a few minutes before we needed to catch the tram back down to meet Sam we stopped for a quick celebratory beer and Bombardino. We almost lost Kate at this point too. She took a bigger drink of her Bombardino than expected and almost chocked to death. Not a pretty sight but she made it through. Love ya Kate! Next stop Pepita's Cafe in La Thule! Heidi and I have been to Pepita's three times since Ben and Nelly took use there a year ago. I'm pretty sure I've written about it in our La Thule post from last summer. The food is so amazing we had to let The Hugo's, Sam, and Owen in on it. It did not disappoint. I think Kate even put her head in her hands in amazement after the first bite and never stopped smiling throughout the meal. I can't really say much other than if you are every even close to this place you have to come and eat. To the QC Terme! Another place not to miss if you're in Pre' Saint Didier. Think of a modern spa on steroids and so many ways to relax you couldn't possibly do it all in a day. This was a perfect way to end yet another perfect day of skiing in the Alps. For what would end up being our last day of skiing for the trip, we would meet back up with Bastiou for one last adventure. This tour would take us through the Aiguilles Rouges massif which is on the opposite side of the the Chamonix Valley and the Monte Blanc massif. Unfortunately, we would be missing Owen for this tour due to illness. Miss ya buddy! Our day would begin with a short trip up to the top of the La Flegere where we'd traverse over to the next drainage that would put us just above Le Refuge du Lac Blanc. From here we had a view of the tallest peak in the range, the Aiguille du Belvedere standing just shy of 3000 meters. This peak would be our guide up to the Col du Belvedere where the fun would begin. We put skins on for the walk and made our way to the col. The skin up to the Col du Belvedere was a straight forward route up the southern aspect of a giant bowl. The surrounding terrain was stunning, add that to the views across the valley and it was easy to forget that we were walking uphill. The group knew that once we reached the col that we would have a short rappel into a steep chute before we could continue our day. Not so straight forward. At the top of the Col du Belvedere we all harnessed up, peeled our skins off and prepared to be lowered 60 meters into a 50 degree (plus) chute. In certain conditions skiing this chute could have been a possibility but the snow conditions this day required us to travel safely and use rope and harnesses. Bastiou had asked that I go down first to direct the group into an area where we would all meet to finish the decent through the chute. This area was described to me as a "bench" where once we were off the rope we could ski the remaining way down or hangout until Bastiou arrived. I arrived at this bench to find three other skiers working there way down the chute with ropes. I unclipped my rope and tied off to another rope anchored to a rock above the bench. My first thought was there is no way were getting 6 people in here. The "bench" was more like a chunk of snow the length and width of my skis. Room for me, but no room for you. My view down the remaining chute looked pretty similar to the top. Steep and exposed with variable snow. And having just watched three other skiers use rope to descend another 50 meters, I was going to hang out and wait for Bastiou. As everyone in the group started arriving, the space on our "bench" was starting to get tighter and little more worrisome. Heidi come down after me, then Kate, Tim, Charlie, and finally Bastiou. Who actually skied down to us. Charlie, feeling the bench getting overcrowded, was the stud of the day and decide to ski down to the bottom of the chute like a pro. Still not feeling super confident with the conditions, the rest of group roped up and skied down to a small choke in the chute where we unclipped from the rope and skied to a huge apron below the chute. Regrouped out on the apron, we all were pretty impressed with our effort in what we had all just skied. Even if we did need a little help. Skiing a line you have never seen before in strange and exposed terrain gives one a real sense of foreboding. Looking back on some of the terrain, we may just ski it next time. But to error on the side of caution was the right call to make. Especially in the French Alps. I wish I could say the rest of the ski down to the town of La Poya was silky smooth but I can't. The snow conditions made for some of the most difficult skiing I've ever experienced. With that being said though, there will never be a time when the snow conditions could ruin an exciting tour like this. We gingerly made our way down to the valley floor where we followed a small creek to town. We were all smiles when we skied up to the small bar awaiting us. This tour will also go down as one of the best and most exciting. That night we had reservations at the Le Chaudron in Chamonix to celebrate Heidi's birthday. A bit late but we wanted to have a little celebration (or a week of celebrating) with some friends to really seal the deal of turning 28 for the twelfth time. Ben and Nelly even made the journey over from Bourg St. Maurice in record time to meet us for the night. It's always a blast having those two around. Dinner was outstanding and the company even better. The next day the rain set in and sealed our fate for the day and the trip. The skiing was over. We all enjoyed a little extra sleep that morning and spent the afternoon wondered around town until lunch. After lunch, Ben and Nelly took off for home and we all shifted gears toward our departure the following day. This is where I tell you that this trip will go down as one of the most exciting and adventurous, ever. Yeah, the snow wasn't great. But you don't come to France to ski chest deep snow. You come to have an alpine experience like no other. And that, we did. We had perfect weather almost the whole trip. Which rarely happens here. Our group was fun and funny, on the same page, flexible, sick (literally and figuratively), and stress free. It's difficult to travel with so many great friends and not once get on each other nerves. Nice job team! Let's do it again soon. A big thanks to Bastiou who but together two remarkable days of skiing. I can't say enough about his relaxed demeanor and huge smile. He felt like just another part of our group, or should I say he made US fell like a part of his group. If you're ever in need of a good time in Chamonix look him up. UNTIL NEXT TIME MY FRIENDS!!!! Just a quick note: Check out everyone's Instagram pages for more great pics. @ofrogg, @katethebiker, @wolf.chuckfred, @tabernash609 all have some great photos form the trip. I should also have my Flickr account updated in the next couple of days with more pics from the trip. Enjoy.